Thanks to big interest in our works, our collection of Natural Herb Dye thread is almost sold out! We are working on producing more Natural Herb Dye thread. Meanwhile, don’t miss our good variation of Sashiko thread chemically dyed. They are specifically designed for Sashiko purpose, and we believe they are the best in Sashiko with reasonable price. We use our Sashiko threads in every pieces we produce. Both Mono-Color and Variegated Color thread will meet your satisfaction! 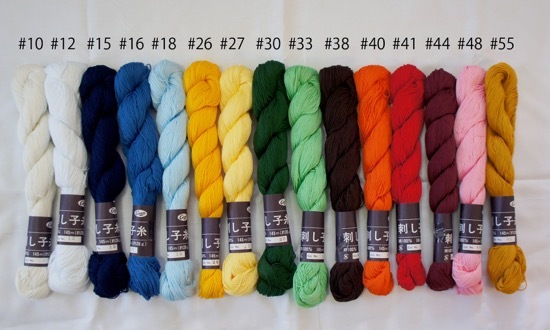 Please try our Sashiko thread and enrich your Sashiko experience! We are a group of Sashiko artists, Keiko & Atsushi Futatsuya, striving to pass down the beautiful hand-stitching culture developed in Japan. Our professions are in Sashiko & Boro. As of 2018, we do not have a storefront to show you what we create. However, private store-front may be available by appointment. Pensylvania, USA | Offering Sashiko workshop as well as Sashiko Supplies.